Private cloud services are gaining new momentum, partly due to the demand for hybrid IT solutions on-premises. 451 Research predicts that IT vendors with OpenStack private cloud revenue will exceed revenue from service providers with OpenStack-based public cloud implementations in 2018. From a regional perspective, deployments in China and the Asia-Pacific region are now growing faster than in the rest of the world. While not the primary driver, a contributing factor is the Chinese government advocating for OpenStack deployments. 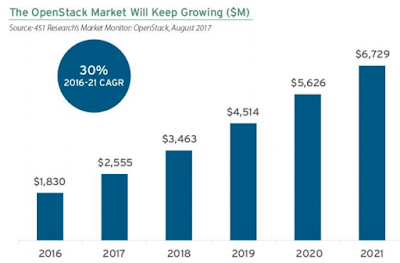 According to the latest worldwide market study by 451 Research, OpenStack revenue will exceed $6 billion by 2021, as it experiences a growth rate of 30 percent CAGR. Moreover, OpenStack is benefiting from the increase in hybrid cloud environments with 61 percent of the enterprises surveyed utilizing a hybrid IT approach. Certain industry verticals and regions that are less enthusiastic about exclusively using hyperscale cloud service providers. The OpenStack development community has made progress addressing challenges in installation and rolling upgrades over the last two years, resulting in increasing production deployments. This will continue in 2018 as OpenStack becomes more pervasive and risk is reduced for enterprise use. The platform was once limited to development or testing and proof-of-concept deployments, but there are mission-critical workloads on OpenStack across nearly all enterprise verticals and regions. Previously, OpenStack revenue had been overwhelmingly from cloud service providers offering multi-tenant IaaS, but 451 Research now finds that OpenStack growth is shifting towards the private cloud space faster than previously expected. While containers are eclipsing OpenStack in terms of attention, 451 Research believes that very few OpenStack users are abandoning the platform. In reality, some of the most innovative and progressive OpenStack deployments feature the use of container technology -- such as Docker and Kubernetes. "OpenStack has solidified its position as the leading open source option for building private and public cloud environments, but it is no longer the shiny new toy in the industry – that torch has been passed to containers and microservices," said Al Sadowski, vice president at 451 Research. And while there is no clear answer yet about OpenStack coexistence with containers, it is worth noting that containers and container management are nascent markets in terms of production use cases. 451 Research found that that the OpenStack market is coalescing around a handful of the top providers, just as happened with the Linux OS in the past. Parallels have always been drawn between OpenStack and Linux but the comparisons are even more valid today as the top Linux vendors are also key OpenStack vendors.